This page describes how to create a read replica for a Cloud SQL instance. A read replica is a copy of the master that reflects changes to the master instance in almost real time. You create a replica to offload read requests or analytics traffic from the master. 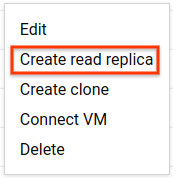 You can create multiple read replicas for a single master instance. Note: Read replicas do not provide failover capability. To provide failover capability for a PostgreSQL instance, see Configuring an Instance for High Availability. For more information about how replication works, see Requirements and Tips for Configuring Replication. Find the instance you want to create a replica for, and open its more actions menu at the far right of its listing. If you do not see that choice, the instance is a replica; you cannot create a replica of a replica. You are returned to the instance page for the master. Use the insert method of the instances resource to create the read replica. The region and databaseVersion properties must be the same as the master. By default, the replica is created with the same number of CPUs and the same amount of memory as the master instance. You can increase these values for the replica, but you cannot decrease them. Learn how to manage replicas. Last updated July 17, 2018.